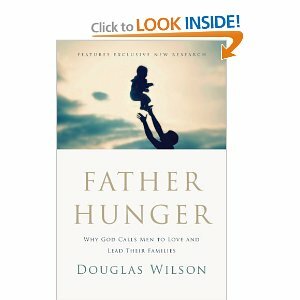 Father Hunger by Douglas Wilson tackles the growing epidemic of absent fathers, and not just fathers who are physically absent, although that is dealt with too. Rather, he looks at how government, feminism, economics, public education, false masculinity, and other factors combine to create a culture that undermines fathers’ role in the family and relationship with their children. Wilson argues that until we regain the biblical ideals of true fatherhood based on our knowledge of our loving Heavenly Father we won't be able to rebuild godly families. Wilson’s book is both informative, providing statistics and research back up his claims, and applicable to daily life. Each chapter includes a set of questions to consider, giving the reader the opportunity to respond to the ideas presented in the chapter. These would probably make good discussion questions if reading this book with a spouse or small group. While I enjoyed much of the information provided in the book, at times I had difficulty following Wilson’s points. I often felt like his thoughts rambled from one topic to another, and he used several illustrations and analogies that I had a hard time connecting with. I also felt like parts of the book were poorly written. His use of unconventional grammar and sentence structure left me working to follow his points, and provide a sort of disjointed feel between the chapters. I believe a good book should be one you flow through without having to reread confusing or difficult passages. Because of this I had a hard time making myself finish the book. Overall I would give Wilson’s book 3 stars--5 for content, but minus 2 for a choppy read.